Richard Darby spent his childhood in Peking and Shanghai before moving to Hong Kong where he joined the customs service. He later joined the army and was taken prisoner by the Japanese on Christmas day 1941. He was interred in a Hong Kong POW camp before being sent as slave labour to a coal mine 100 miles from Tokyo. It was this time in captivity that convinced him to become a priest, and following his release he studied at Durham University for four years before being ordained in 1950 in the Chelmsford diocese. He served in several south of England parishes before moving to the Southwell diocese in Nottinghamshire in 1975 where he was consecrated as bishop. He retired in 1990 and moved to Claypole, just over the county border in Lincolnshire. 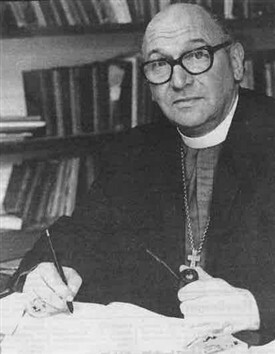 He died in december 1993 aged 74, a memorial service being held at Southwell Minster in March 1994. He is buried at St.Michael's church, Halam, where he had lived with his family for 14 years prior to retirement. Th bishops hobbies included fly fishing and he was also a vintage vehicle enthusiast and restored old motorcycles and Bentley motor cars. This page was added by Website Administrator on 28/04/2014.